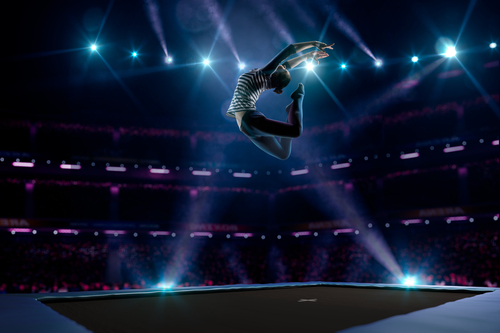 Are your moves on the trampoline up to competitive stage? A routine must always start and finish on feet. Competitors must start their routine within 60 seconds after presenting to the judges. Competitors are permitted up to one “out bounce”, a straight jump to control their height at the end of a routine, before sticking the landing. The trampolinist must stop completely – this means that the bed must stop moving – and they have to hold still for a count of 3 seconds before moving. In competitions, moves must usually be performed in one of the following 3 basic shapes: Tucked, piked straight. Did you know we make Olympic standard trampolines? Ready to take your moves to the Olympics? !